This temple, also known as the Divine Progenitors Temple, was constructed in 1787 when seven images of Divine Progenitors were brought over by immigrants from Anxi. The most powerful of these is believed to be the Penglai Divine Progenitor, also called the "Nose Dropping Divine Progenitor." Legend has it that when a disaster was about to happen, the nose of this image would fall off as a warning to his devotees, and would resume its position only after the calamity was over. Qingshui Temple's long history is reflected in its decoration. As you enter the temple you are greeted by a pair of large dragon pillars in front of the central doors of the front court; the brick carvings on both sides of the outer wall date from the late 18th century and early 19th century, making them the oldest pieces of art in the temple. Also of interest are the inscriptions of Qing Dynasty reign periods on the beams, stone walls, and dragon pillars. 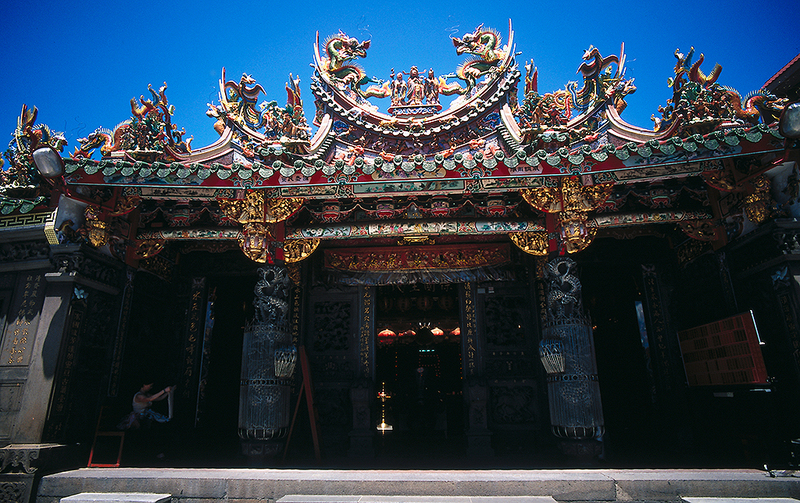 Qingshui Temple has been called the most characteristic example of mid-Qing temple architecture in Taiwan. Nat'l Hwy 1 → Exit at the Taipei Interchange → Prov. Hwy 2B → Minzu W. Rd. → Expressway → Sec. 2, Guiyang St. → Kangding Rd. Nat'l Hwy 3 → Exit at the Zhonghe Interchange → County Hwy 106A → Township Road Bei-91 → County Hwy 114 → Guangfu Bridge → Sec. 2 to 1, Xiyuan Rd. → Sec. 2, Guiyang St. → Kangding Rd. Take THSR or train to Taipei Station, transfer Taipei City Bus (No. 49, 218) to Zushi Temple Stop.